Visitors to UA Little Rock Downtown view "The Struggle of the South" by Joe Jones. 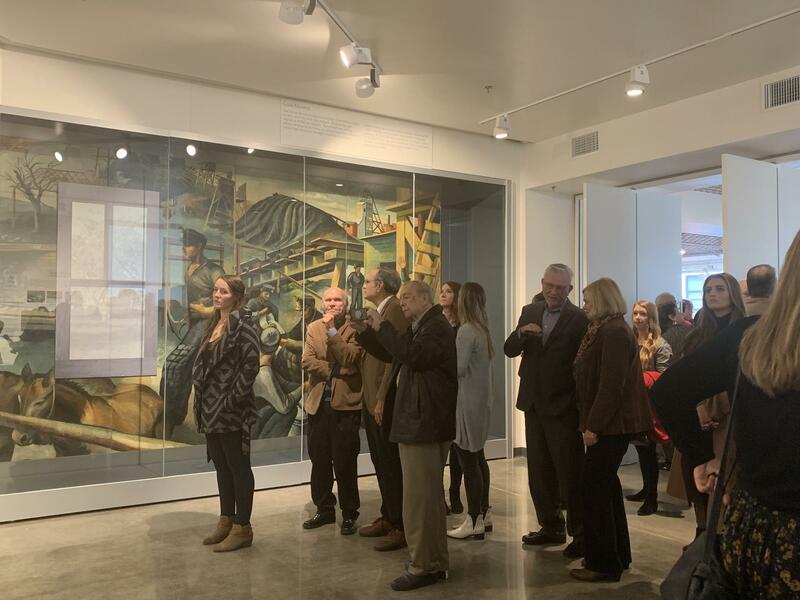 The University of Arkansas at Little Rock officially has a downtown space where visitors can learn about the university, attend occasional lectures and view a mural painted in 1935. The university held its opening ceremony Wednesday afternoon, which featured speeches from UA Little Rock officials and the mayor. UA Little Rock Chancellor Dr. Andrew Rogerson spoke on how since he began his tenure over two years ago, there was talk about the necessity of a downtown space, especially as the only four-year public research university in the city. "We understand the importance of making our vital urban campus relevant and accessible here in the heart of the city. We wanted a space that honored the past, engaged the present and imagined the future, and that is what this multi-space reflects," Rogerson said. Little Rock Mayor and graduate of UA Little Rock Frank Scott Jr. also gave a speech at the opening. He said the new downtown building will increase UA Little Rock’s presence in the city and the importance of the university to Little Rock. "As we all know a great thriving city has to have a great university and this is the capital city’s university and we have to continue to increase our confidence and our swagger on how we talk about UA Little Rock," Scott said. "Because this city, this university is taking it to the next future to create a new Little Rock that’s going to truly reach its true potential." In addition to a space where visitors can learn more about the university, the space is available to rent for meetings and events, will hold lectures from UA Little Rock faculty some evenings and is home to the mural "The Struggle of the South" by artist Joe Jones. The building will be open to the public Tuesday through Saturday, from 11 a.m. to 4 p.m.
KUAR is housed at the main campus of UA Little Rock, but its newsroom and editorial judgement remain independent. Little Rock's only four-year public research university is preparing to expand its presence in Arkansas's capital. A grand opening for UA Little Rock Downtown is set for Wednesday at noon at the center's location on President Clinton Ave. in Little Rock's River Market district. It will offer meeting space, faculty lectures and a series of extended education courses not for college credit.